Please call 414-425-7150 ext 3 for a quote. 8.99Chicken ParmigianaIncludes, Chicken parmigiana, pasta with red sauce, our house salad, dressing, and Italian bread and butter. 7.99Ravioli(Meat, cheese, or a combo of both) Includes our house salad, Italian dressing, Italian bread, and butter. $10.49Sicilian Steak 5ozBreaded Tenderloin, served with penne pasta in garlic butter, house salad, dressing, and Italian bread and butter. $8.99Rigatoni AlfredoServed with house salad, dressing, and Italian bread and butter. $9.99Shrimp & Bow Tie PastaIn Garlic Butter Served with house salad, dressing, and Italian bread and butter. $9.25Mushroom RavioliRavioli filled with Portabella and Button mushrooms. Served in a mushroom cream sauce with toasted pine nuts. $9.49Chicken MarsalaIn a mushroom wine sauce. 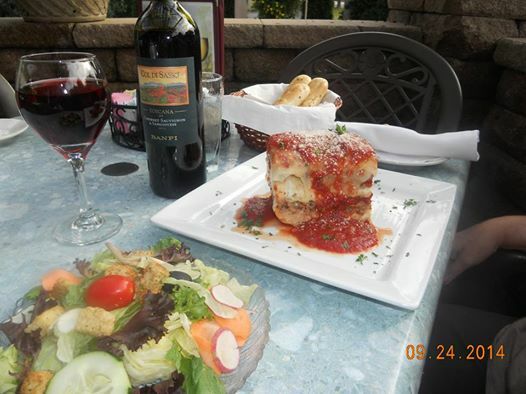 Served with Penne pasta in garlic butter sauce, our famous house salad, dressing, and Italian bread and butter. $8.50Baked ZitiServed with house salad, dressing, and Italian bread and butter. $9.99Chicken CarolinaServed with house salad, dressing, and Italian bread and butter. Most items are available off our dinning room menu and can be ordered with minimal notice. Call (414) 425-7150 ext. 3 for further pricing.